Following last week’s launch of the d2 Network and Big Disk Network, LaCie on Monday has introduced the 2big Network and the 5big Network, two new Network Attached Storage (NAS) systems. They’re priced starting at $320 and $800 respectively. The 5big Network has five hot-swappable drive bays that support seven RAID modes. 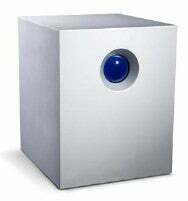 It’s available in storage capacities up to 10TB of storage capacity. It also has a Gigabit Ethernet connection, is UPnP-AV compatible and will work with any DLNA device, so it’s able to stream audio and video content to game consoles and compatible televisions. It also works as an iTunes server. The 2big Network is a two-bay RAID system that supports up to 4 terabytes (TB) of storage capacity. It features Windows Active Directory Support (ADS) and local backup capabilities, ships with client licenses for Intego Backup Manager Pro for the Mac, and is compatible with Leopard’s Time Machine feature. It’s equipped with a Gigabit Ethernet port, UPnP and DLNA support, and more.